I practically grew up inside a Hallmark Store. My mother and grandmother both worked at one for years. I helped out at the store as a kid and worked there over the holidays when I was in college. Growing up, really to this day, my mother sent cards to everyone all the time, every occasion. When we were first married I remember my husband saying on more than one occasion, "they make cards for that?" We live pretty far from all our cousins so our kids only see each other a few times a year. We also have friends that are like family, roommates from college, and their kids that our spread out all over the state and country. I’ve been trying to be more like my mom and send more cards, more often to make them smile, or say hi. My biggest problem is that I generally forget to pick them up, or it’s not in the budget to spend $2-3 on a card, plus another almost $0.50 on postage. Hallmark is changing that though and making it easier and more affordable than ever for you to keep in touch, send love, or holiday greetings to those family and friends near and far. 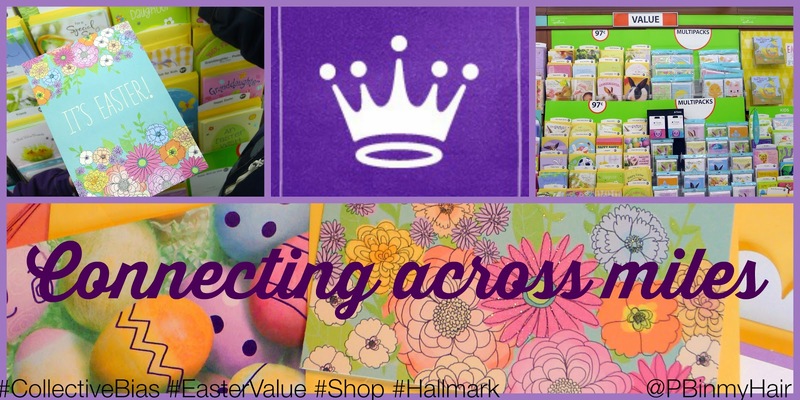 Aside from the ease of having a Hallmark store located in our local Walmart the Hallmark Easter Value Greeting Cards are all priced at $0.47-0.97 cents! At that price we can afford not only to buy them for everyone we are missing, but we can afford to throw a few extra surprises in the envelope to send some holiday cheer! The kids and I headed to Walmart this weekend to check out the Hallmark Easter Value Greeting Cards and I was so surprised. Back in the day the cards that were considered a “value” or were priced at $0.99 or less were generally the smallest, and frankly the hokiest. They were never the big colorful, or glittery ones that I wanted. They were also extremely limited in the variety. You basically had to choose a generic message. There was a good size selection and they included all kinds. For kids, for family, religious, simple, fancy, and packs. The kids had a great time picking out the cards and trying to choose what their cousins would like best. Since we saved so much money on cards we were able to get some fun add-ons - egg decorating stickers, an Easter book, character stickers, to send with the cards! 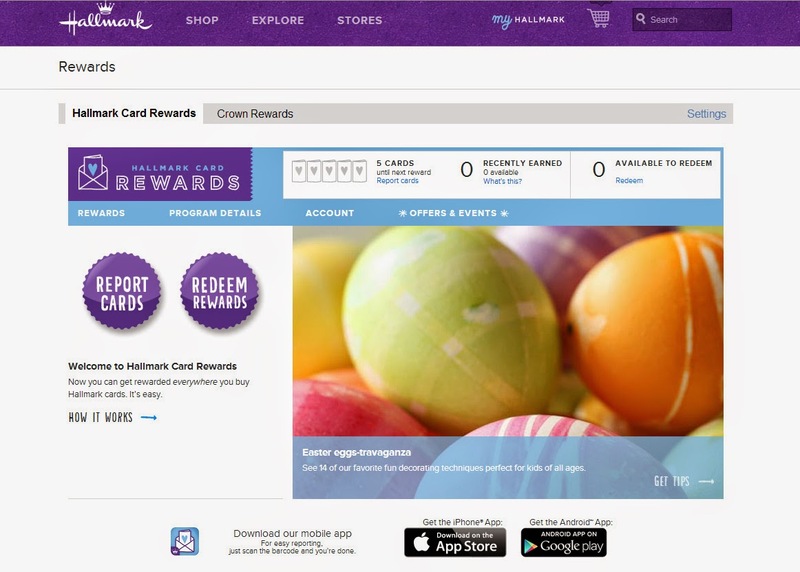 In addition to the value of the cards with the new Hallmark Rewards Program you can get points for your cards no matter where you buy them. With Hallmark Rewards you get a free card for every 5 cards you purchase. The best part, for me at least, is that I don’t have to remember to have a reward card in my wallet or yet another one on my key-chain. I can enter the cards myself on the Hallmark Card Rewards website or download the free app and scan them in. The app was so easy to use and so quick, 20 seconds and they were all in and I was on my way to a free card! I’ve been a crown rewards member since they started the program but haven't been earning points since I hardly ever make it to the store. Now that I can pick up cards at Walmart and get points for them I’ll be even more encouraged to send cards just because! I’m hoping that the kids will have so much fun decorating these packages and writing to their cousins that it will instill in them that sense of fun in giving. It’s also hopefully instilling in them the importance of staying connected, with family and friends, even when we can’t be with them in person.